courtesy the Lawrence Journal World. The results say it all for the Falcons. At 6-0 they're off to their best start since 2005, when they finished the season 9-2. The only downside for the Falcons is that they won't be able to claim the league title or gain bragging rights over all of Olathe, until they face Olathe East in week nine. The Lancers lost ugly last week, but won ugly this week. 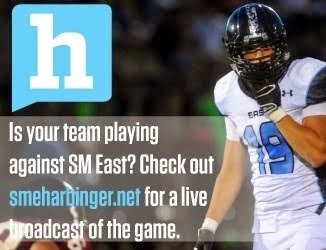 Given the injuries suffered, SM East will take being 3-3 heading into districts. On paper they'll be favored to go 3-0 to close out the season. After a decent victory on Friday the Ravens are sitting at .500 heading into district play. If only they could develop something resembling a defense (they've given up 40 or more points four times in six games) they might be able to pull out a couple victories and make the playoffs. We saw this same sort of thing happen last year when Olathe East downed Olathe North 25-0 in late September--and it really didn't make a difference down the stretch. The only thing is, outside of Olathe East, Olathe North really hasn't beat many good teams. Overshadowing Free State's last-minute 97-yard touchdown drive was the fact that the team wasn't able to convert a game tying two-point conversion late, or that they missed a PAT earlier which forced them to go for the two-point conversion. It's little miscues like those that have haunted Free State for years. After a solid first half effort the Raiders weren't able to come away with any points in the second half of their 42-17 loss at Lawrence. If SM South has a shot at making the playoffs it's going to have to come with consistent scoring from their offense--because the defense hasn't bailed them out at all this year. Brad Strauss, Lawrence: In the mold of fomer Sunflower League greats like Derek Miller and Dustin Moomau, Strauss is playing offense, defense, and special teams, and dominating. He scored six touchdowns on Friday. One came on a kickoff return, four were on rushing scores, and one was on a pass. Armani Williams, SM West: Williams has taken quite a few shots from the media and fans alike, and, to be honest, he came into a situation with pretty high standards for the Vikings. His predecessors included Tyler Lawrence (a 20-game winner who played at KU), Blake Lawrence (a Simone finalist who was offered to play quarterback at Missouri) and DJ Balazs (a 21-game winner). Williams finally played a great game, tossing three touchdowns passes and running for another in SM West's 28-point win Friday night. 1. Olathe South (6-0): The Falcons' latest performance was easily their most impressive of the season. The team's seemingly endless stable of running backs makes them a preparation headache for any school. 2. Olathe North (5-1): In some ways the Eagles may benefit from their loss to Olathe South. They won't have as much pressure as the top dog, and you know what they say about how hard it is to beat a good team twice--assuming they meet up again with Olathe South in the playoffs. 3. Olathe East (5-1): With all the attention given to their neighbors to the North and South, Olathe East has quietly snuck up at 5-1, with an offensive attack that gets stronger every week. 4. Lawrence (4-2): Lawrence's district poses a good challenge, but regardless of how well they do, be sure to keep an eye on Brad Strauss. You don't see kids putting up his type of numbers very often in the Sunflower League. 5. SM East (3-3): The Lancers can make up for some of their early season losses by sweeping their district and rolling into the playoffs at a very respectable 6-3... but we've seen what the expectation bug has done to the team in the past. 6. 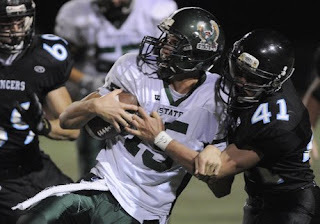 Lawrence Free State (4-2): As has been the case for the last six years, Bob Lisher found an athlete, stuck him at quarterback (Kyle McFarland being the athlete this year), and now has a team with one of the best offenses in the league. 7. SM West (3-3): We'll see if the Vikings can finally string together a two-game winning streak. They'll be favored against SM South, but they also haven't faced an opponent whose head coach has as intricate of a knowledge of their own strengths and weaknesses as SM South's Ryan Lonergan. 8. Olathe Northwest (3-3): This is Todd Dain's eighth year at Olathe Northwest, and you could make the case that this is his best team yet. Their district doesn't do them any favors, but to be among the best you have to beat the best. 9. SM Northwest (1-5): You can open your eyes now, Cougars. The non-district stretch of your season is over. Awaiting you in your district are three teams with a combined record of 3-15. 10. SM North (1-5): While they did lose to Olathe Northwest, the Indian's showed alot of fight and came within a touchdown of tying the game up in the fourth quarter. Mason Perez is also a bigtime playmaker that would be getting mentioned among the league's best if he played for a better team. 11. SM South (1-5): The Raiders should close out the season with at least one more win. However, despite their poor record, I think things are boding well for the program now and into the future. 12. Leavenworth (0-6): It's do or die time for the Pioneers. Hopefully they can beat Wyandotte this week and claim at least one victory on the season. Heck, they may even pull an upset out in one of their next two games and make the playoffs. apparently SME 2nd string QB nick pirotte tore a pectoral muscle in practice and 3rd string QB (soph) Christian Blessing will be taking the snaps for a week or two until collins is back. this could prove very detrimental as EAST heads into districts. Eaglelover... Ishe is my cousin.